* Pride and place this week goes to the Under-10 Boys Footballers who came away with the Bobby Carson Memorial Cup at a tournament organized by the Mayobridge Club on Sunday Morning. The teams taking part were Mayobridge, Drumgath, Newry Mitchels and Castlewellan. The lads have really put their work in on Saturday mornings and Tuesday evenings and have got some reward at the end of a long season. Thank you to the coaches Terry Connolly, Aidan Rodgers, Ciaran McCabe and Francie McAlinden who have put in a lot of work this year writes Michael McClean. It certainly went to prove that what you put into it you will get out of it. Thank you to all the parents who came along not only on Saturday but all year and helped and encouraged the young children develop their skills. Helping out at the Castewellan GAC coffee morning. * Sunday saw the biggest moment of Gavin Corrigan’s refereeing career when he was the man in the middle for the Ladies Senior Football Final at Croke Park. Gavin did a great job. Cork who picked up their sixth title in recent years were too strong for a Kerry team who were in their first final for 19 years. Thankfully everything went well for Gavin on the day and like all good referees was rarely seen or heard for that matter. It was great to see a Castlewellan man in the centre of things in Croke Park. Well done to Gavin. * On Saturday we had our last outdoor juvenile training session of 2012. 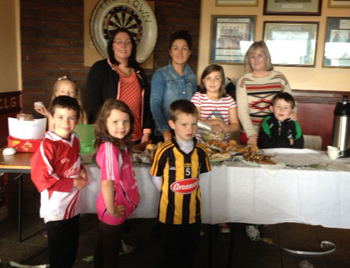 To coincide with the event we also held a charity coffee morning fundraiser in the club. The event was a great success and was well organised by all concerned. The family atmosphere around the club was absolutely fantastic. The sight of Leo Flanagan nursing the latest edition to the Flanagan clan was marvelous. Leo’s was nursed the whole way through his football career so now he’s giving that wee bit back (only saying!). 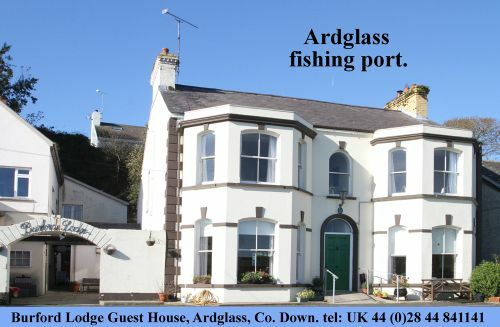 There was great craic and fun all the way. It would be wrong to single out any one in particular except to say thank you to all the mothers whom provided cakes and buns and also assisted in the club throughout the morning. Let’s not forget the children who all assisted admirably. The total raised on the morning was a fantastic total of £368.62. This will be donated to the Bridgewater Suite. 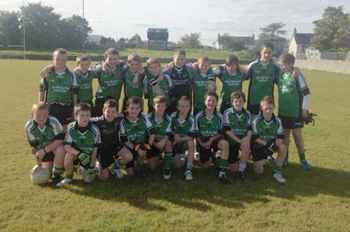 * The Under-13 Footballers played their second game in the Championship on Sunday past at home to St Paul’s. As we all know it was a good day weather wise and that the football on show from both teams was absolutely fantastic. The effort and genuine fervor of the boys made it a good game for referee Alan Grant to officiate. The Town won well in the end with some quite slick football with no hint of selfishness from the players. Quite often when a player was bearing down on goal they slipped the ball to a player in a better position and that is good to see. Well done to the young lads for their hard working performance. * The Senior Lady Footballers represented the Club at the Ladies All-Ireland Sevens On Saturday past At Naomh Mearnog, Portmarnock in Dublin. The day was certainly an adventurous one with the girls setting off early with their mentor Jim Burns, Niall McArdle and Cillian Keaveney in tow. There were a few transport problems when their bus broke down but thankfully all was resolved and they made it to the tournament ok. Perhaps the next time they will use old Lazarus! They were up against Banner from Clare Seneschalstown from Meath, Killeeshil from Tyrone and Fingallians from Dublin. Unfortunately the girls did not make it out of their group with only one win against their Tyrone opposition. Banner did go on to the final only to lose out in the end. A real enjoyable day for our Ladies despite coming home empty handed. A good day and night was had by all. * Well things are hotting up in Castelwellan’s Lets Dance. A reminder that limited number of tickets will be on sale on Sunday Night in the Club from 9.00pm for the two semi Finals on 24 November and 1 December. The effort of those taking part has been phenomenal. It is serious competition. All the dancers having been training flat out at practice sessions in the Club with Shane Berger and on their own. It is difficult to get interviews with any of the dancers except to say that Niall McArdle has stated that he and his dance partner Sinead McCartan will win the competition. Sure there’s nothing like a wee bit of modesty and Niall has it by the bucket loads! I am happy to report that there are no broken noses or hairline fractures of the ankles. One contestant has suspended his Hurling duties to avoid such injuries. Don’t worry it’s not you Ray is it Paddy? Further details of the two semi-final nights will be released shortly. * All the juvenile coaches would like to thank parents for their support throughout the year. In the coming weeks we hope will be announcing details of our indoor training session. * A reminder that we are bringing the play “The Pitch” by Shane Connaughton to our Clubrooms on Saturday 20 October. Shane is an Irish writer and actor and is probably best known as co-writer of the Academy Award-nominated screenplay for My Left Foot. The play centre’s on the main character Philly who lived and played for his team, the jersey, the parish, his friends and the very pitch his enemies are now trying to take from him to turn into a housing estate. Tormented by painful memories and the unjust fate that holds him prisoner, he replays the events of that day when his club won the county championship for the one and only time and he wasn’t allowed to play. For him, the old pitch is sacred ground, and it is here that he will make his last stand. Tickets are on sale in the club at £10. * The Clothes Collection is still on-going. Please donate any clothing items you do not require to this! Please leave all bags of clothes with Noreen Keown.